Ecozine was fortunate to recently interview two men with incredible lives, who spend their days working on behalf of Mother Nature, through their roles with The Nature Conservancy (TNC). 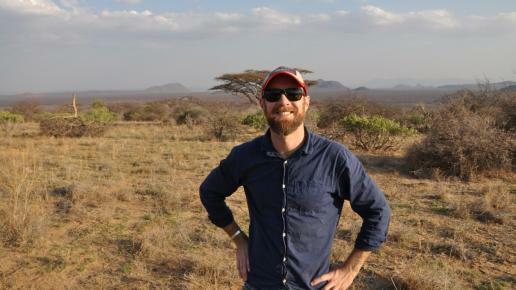 Eddie Game, TNC's Lead Scientist for the Asia Pacific Region, has worked on conservation projects in over 15 countries, applying innovative methods and analyses to projects around the world. Manuai Matawai is Community Conservation Coordinator for The Nature Conservancy’s Papua New Guinea Program, based in Papua New Guinea’s smallest island province, Manus. We asked them about their work with climate change, one of the world's most urgent challenges. Here’s what they told us. Please tell us a little about yourselves, and your work. 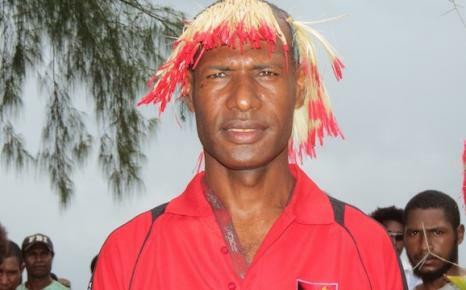 Manuai: I live and work on Manus Island in Papua New Guinea (PNG). In PNG, communities are the traditional owners of over 95 per cent of the country’s natural resources. TNC works with them to create land use plans and practices that take into account factors such climate change and susstainable development, rather than looking at conservation issues in isolation. By working with communities to identify those threats and opportunities, we can help them keep their land and manage it for generations to come. This kind of land-use planning helps protect important areas, builds stronger communities and ensures that people are benefitting from their natural resources. For instance, we’ve made 3D models of villages, and using their traditional knowledge the village agrees collectively to designate certain areas for gardening, hunting, ceremony and conservation. Eddie: As a Lead Scientist with TNC, I have had the privilege to work in many parts of the world and am now focused on Asia Pacific. This region is facing dramatic changes from many aspects of climate change. For example, the islands in the Pacific are already experiencing sea level rise and increased storms. In Indonesia, large areas of forest are being cleared for oil palm plantations that release huge amounts of carbon into the atmosphere. My work, and the work of TNC, is focused on using science to change policy at the highest level of governments and change everyday behaviours. Would you like to share about any specific project(s) you are particularly proud of? 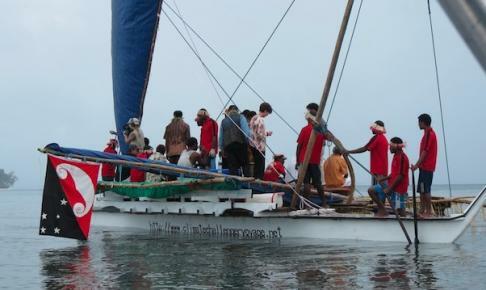 Manuai: I am very proud of my work on the Climate Challenger, a traditional canoe that I hand-built and sailed for two months, over 2,400 kilometers, from Papua New Guinea to the Solomon Islands and back, to raise awareness about climate change. As a result of this voyage, we were able to reach over 5,000 local people and equip them with information about the challenges posed by climate change, and how island communities can adapt to rising tides and harsher storms. We demonstrated things like how to build effective dry stone seawalls, so coastal communities could build defenses against rising waters. Films of the journey have received over 40,000 hits on Youtube and over 1,000 DVDs have been distributed for community awareness across rural provinces in PNG and Solomon Islands. I am now planning a second voyage of the Climate Challenge, hopefully for some time next year! Eddie: I am particularly proud of the work we did in northern Kenya with the Samburu people. The Samburu practise a traditional herding lifestyle in their arid glasslands terrain. Due to the pressures of climate change and population growth, they have had difficulty with food security. We helped them with land-use planning and incentives to change their herding practices. The communities joined together to identify specific areas for animal grazing, to preserve some of their land to act as a reserve, or ‘bank’, of grass for when other areas were too dry. The reserve also attracted wildlife that helped increase tourism. This success story is a great example of a win-win situtation for people and nature. Have you seen firsthand effects of climate change in places you've worked? Manuai: In Manus, we are experiencing many impacts of climate change. People have lost their homes from rising sea levels and increased storms. Encroaching seawater has contaminated wells for drinking water and destroyed food crops. Increasing sea temperatures are threatening marine resources, such as coral reefs, which are used for food and income. The signs are everywhere. Having visited Hong Kong, how do you perceive the local attitude/awareness level toward climate change? Manuai: Hong Kong people living in a big city, more removed from nature and the changes that are happening. It is easy to be distracted by a busy life, work and devices. But climate change is affecting all of us now. We live in a very interconnected world. For example, Hong Kong people enjoy eating sea cucumber, which is a primary fisheries export for PNG, meaning the sea cucumber on Hong Konger’s dinner plates is likely to have come from PNG. If climate change affects the fisheries in PNG, there will be no more sea cucumbers for the people of Hong Kong. Eddie: Hong Kong is such an amazingly connected city, full of energetic people, so it’s perfectly placed to take a leading role in global sustainability. I encourage people and students to take advantage of that, and think about their lives and work in a global sense; to learn about conservation both in their own city and across the planet. If you could highlight one fact about climate change that might impact our readers or support them in becoming more climate-conscious, what would it be? Manuai: My father told me “if you respect nature, you will live longer and have a happy life.” I have grown up believing this to be true. Now, working for TNC, I know the science of climate change, and it is real – and has many different threats, from affecting economies to displacing people from their homes. We are all connected and need to be prepared, plan for the future – for ourselves and each other – and take responsible actions now, for a changing world. Eddie:Conservation is critical to the health of the planet. The things that are vital to us like clean air and water, having enough land to grow food, all are being impacted by climate change already. These are real risks for everyone. We MUST solve this problem in the next 30 years because in the middle of this century the population is predicted to peak. We can’t mess it up between now and then, as we head toward the highest-ever demand for resources. What is your favourite environmental tip? Manuai: Our lands and oceans are only borrowed from the unborn. It is therefore everyone's business to take responsible actions to ensure our land and waters are sustainably managed and resilient to climate change. Eddie: Be proud of practices that save energy, like only using air-con when you really need it, because your behaviour will influence the behaviour of friends and family, probably more than you realise. Eddie: Go and visit Manuai on Manus, it’s an incredible place!